Here's a clip of Jim's AWESOME WORK!!!!!! We had a GREAT time at the meeting this weekend. The bottom pic is of Brenda and her R3 in the Hotel. The next 2 pics are of Keith's Lifeform Scanner and his Periscope. Next shows Doug's R2, Which is built like a tank!!! Next shows a couple of pics showing parts and Darth Vader. for the 12:00 bell to get the new Giant Falcon. Check out Brenda's blog for more. The Intel Atom Motherboard arrived today!!! Now all I need is memory, hard drive etc. meet this weekend in Clearwater, Florida. I install everything, This will make it easier to change things. This video may help explain the direction I'm going with the code, computer and Phidgets. It shows what I have so far. I should be able to start wiring R2 and finally have him moving. 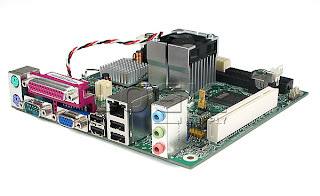 Just ordered my motherboard for R2. and the power consumption is suppose to be lower than the other board. This will run all the Phidgets in R2 along with video, sound and etc. for various features, It should do better. 2- Scooter motors - ? 1- Dome motor - ? Current Total $893.93 without shipping. with Autonomous features it balances out the price. Once I get everything complete and installed I'll go over the total cost comparison. But here's where I stand now. As the code grows I'm learning more and more about what I can do with code. tomorrow. As I said before, This was my original idea of using Phidgets in R2. But I was unsure if I could do it. I've been VERY lucky to have had help with the code and working with it I've learned much more than I would have if I were just working out of the books. Reducing the cost of buying seperate electronics for each feature needed to get R2 moving. Most builders use standard R/C remotes and add sound boards and other electronics to aquire the same results which can up money very quickly. Nothing wrong with that, But I like to keep the money in my pocket. to make the code a easy setup. I got the sound code setup for the gamepad. and then I press button 1 and this plays a certain R2 beep. and press button 1, Now the same button 1 plays my R2 intro. When I use button 1 by itself it controls a servo. This gives me more buttons than I could ask from my gamepad. If everything goes as planned, I should have this code complete soon. The only thing slowing me down now is parts I need to complete this package. Not much to post lately, But I'm still at my code. on the sound files to work with the gamepad. top buttons and this will give me my song jingles. top buttons, This will give me my R2 beeps. The code is growing and I need more Phidgets to get the other servos going. will have to do is buy parts and maybe customize the code.